What can you do with a mixer plug‑in that operates on a single track? With Blue Cat Audio's innovative MIDI side‑chaining system, the sky's the limit. 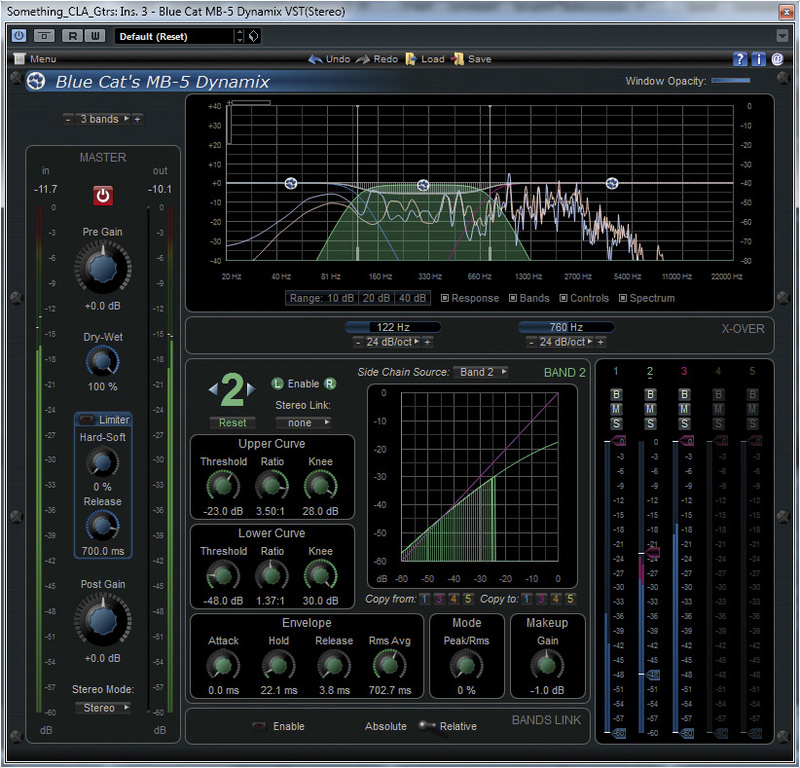 All Blue Cat Audio plug‑ins are skinnable: this is the default skin for the MB7 Mixer. Blue Cat Audio are plug‑in developers who put an enormous amount of thought into their products, creating an extremely powerful and flexible range of processors. If there's something you want to do to the dynamics or tone of your audio, no matter how obscure or involved, the chances are you can set up one of their compressors or EQs to do it — if you're prepared to get to grips with a fairly heavyweight selection of controls. A common feature that marks out many Blue Cat products is the ability to link multiple instances across different mixer channels, and to stream data between them as MIDI CCs, making possible a wealth of clever effects. The latest additions to their range are both multi‑band plug‑ins, and are available in all common real‑time plug‑in formats on Mac and PC. MB5 Dynamix is an extremely flexible but basically conventional multi‑band compressor/expander, of which more in a moment; MB7 Mixer, meanwhile, is a slightly more unusual affair. In essence, it provides a very comprehensive way of splitting your audio into up to seven frequency bands, adjusting the level, pan and stereo width of each band independently, and then recombining them — as the name suggests, it is literally a mixer, but one that takes a single track as its input! That might seem an odd idea, but it actually provides alternative ways of implementing a number of fairly common processes. For example, since you have control not only over the width and gain of each frequency band, but also the sharpness of the crossovers between them, you can employ MB7 in the same role for which you might want to use a parametric EQ, with the advantage that the shape of each band can be asymmetrical. By increasing the stereo width of the high‑frequency bands and summing the lowest band to mono, meanwhile, you're recreating a familiar sort of mastering process. MB7 also has some fresh tricks up its sleeve, and most of these relate to Blue Cat's trademark linking techniques. The key here is that each band can be assigned to any of 16 'groups': eight of these are specific to its own plug‑in instance, while the other eight are linked across your DAW session. So if, for example, you have slightly too much going on in the mid‑range when your vocal comes in, you could use a single fader to duck 1kHz on the guitars, 2kHz on the piano and 3kHz on the drum overheads, simultaneously. Better still, you can invert a channel's group assignment, so that a single fader move simultaneously pushes the mid‑range on the vocal and attenuates the same area on the guitars. Pan and stereo width controls are grouped too, so you could have a single pan‑pot that pushes the mid‑frequencies on your Rhodes and your electric guitar to opposite sides of the mix. The possibilities are, quite literally, endless. MB5 Dynamix is one of the most heavily featured multi‑band compressors you're likely to see! Like most of Blue Cat's plug‑ins, MB7 makes many of its key internal variables available as MIDI Continuous Controller data, which can be recorded to a MIDI track or routed directly to parameters within another Blue Cat plug‑in elsewhere in your project, should your host software permit it. You can, for example, create a MIDI data stream that follows the peak level of the audio within your chosen MB7 band, with appropriate scaling and smoothing applied, then use this to control the gain of another band within another instance of MB7. This allows you to set up complex, frequency‑conscious side‑chaining arrangements that would not be possible with any other plug‑ins I know of. Take, for instance, a situation where a bass line incorporates a few notes or phrases played high up the neck; the bass in general sounds fine, but these notes are getting lost behind the guitars, and simply using automation to bring them up in level makes them jump out awkwardly. By using an instance of MB7 on the bass and another on the guitars, you could first isolate the frequency range occupied by the high notes and have its peak value fed out as a MIDI CC. Once you've arranged to feed that MIDI data into the MB7 instance on the guitars, you can scale it and invert it such that the more the bass pushes that frequency region, the more it is ducked on the guitars. Or how about creating a stereo pumping effect by having the low end of a drum loop trigger the Width parameter on the high band of the guitars? The possibilities become even more head‑spinning when you think about how this MIDI data might be shared between two or more different plug‑ins from the Blue Cat range. To return to the MB5 multi‑band compressor, for example, each of its bands makes available four different data streams: the input and output levels, the amount of compression it's applying, and the total amount of gain being applied in that band. And if you set its global wet/dry control to 100 percent dry, you can use it purely as a side‑chain processor that doesn't affect the signal on its own track at all. As a simple (and slightly artificial!) example, let's say you've printed a vocal reverb as an audio track in your DAW, and you've noticed rather belatedly that it's too sibilant. Attempting to tame this track using a conventional de‑esser is unlikely to work, but if you have MB5 and MB7 in your armoury, you could set the former up to perform aggressive, frequency‑conscious compression in the 5kHz region of the dry vocal track, set the wet/dry balance so that the vocal was only slightly de‑essed, but side‑chain this band to a similar frequency band in an instance of MB7 on the sibilant reverb. Don't forget, too, that we are dealing with MIDI here, so you are not committed to simply using the raw data from one plug‑in to control others. By using MIDI insert processors, or by recording the data and editing it, you have all sorts of opportunities to process the information before it gets used to control the destination plug‑in. Before we get too giddy with excitement, though, it should be pointed out that actually implementing crazy side‑chaining concepts with these plug‑ins can be a lot less fun than thinking them up in the first place. 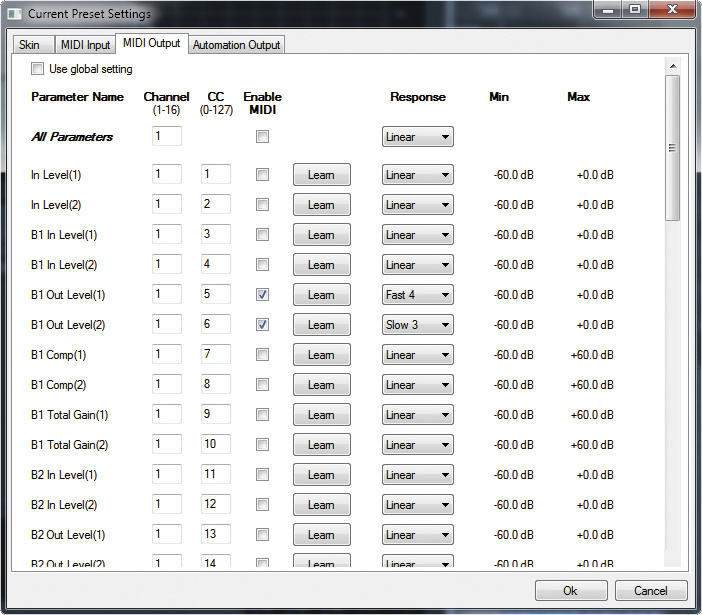 For one thing, you'll need to find a way of routing MIDI data between two plug‑ins on different mixer channels. Depending on your DAW, this could be relatively straightforward, fiddly and annoying, or downright impossible in the case of hosts such as SADiE that have no MIDI support at all. And even once you've got that figured out, actually setting up a MIDI side‑chain that works and does what you expect it to can be a frustrating business. Each instance of a Blue Cat plug‑in can be configured either to use a global set of MIDI assignments, or to have its own set, which gets saved along with the plug‑in settings when you store a preset. That's fine, but actually editing these MIDI assignments involves clicking on a small button to bring up a menu, from which you then have to choose 'Global Settings' or 'Local Settings'. To access the extensive MIDI control facilities in these Blue Cat plug‑ins, you need to go into a menu and open this Settings dialogue. These, in turn, bring up separate but identical editing windows containing four tabbed pages; both windows take several seconds to appear and, annoyingly, the first page sets what graphical 'skin' you want the plug‑in to use — a setting most of us are likely to use approximately no times ever in our lives. 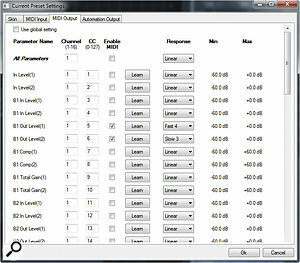 The much more useful MIDI input and output settings are on further tabs behind this, and each presents a long list of parameters for which you can enable MIDI input or output, set a MIDI channel and CC value, and, where appropriate, maximum and minimum values, plus a 'response' setting which varies from 'Slow 5' through the default 'Linear' to, you guessed it, 'Fast 5'. 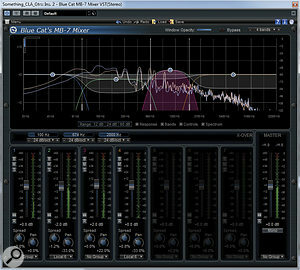 Thus simply setting up a side‑chain link between two different Blue Cat plug‑ins is far from trivial, involving, as it does, loading up their respective MIDI input and output pages, setting the parameters you want to link to use the same MIDI CC, and creating a record‑enabled MIDI track or other real‑time link to transmit the data. The process of fine‑tuning such a link to give the results you want, meanwhile, would sometimes try the patience of saints. One quickly grows tired of repeatedly clicking the menu button, waiting for the Settings window to appear, clicking on the appropriate tab, scrolling to the parameter you want to adjust and tweaking its maximum value or response curve to try to get the dynamic behaviour you're after. The process is not made easier by the fact that the 'slow' and 'fast' settings seem to do the opposite of what you'd expect. And in situations where you need a rapid dynamic response, the relatively coarse nature of the MIDI data stream output by these plug‑ins can be a problem: when I recorded the MIDI output onto a track, it consisted of perhaps 15 or 16 values per second per parameter, regardless of song tempo, which is not really enough to represent accurately the dynamic nuances of fast drum and percussion tracks. Here, I've recorded the MIDI CC data corresponding to the peak level of one frequency band on a kick‑drum track. As you can see, the 'sample rate' is quite low, limiting the accuracy with which the curve can represent the original dynamics. To be fair to Blue Cat, it's hardly their fault that there isn't a better way of sending control data between plug‑ins. They are also actively working to address most of these issues: future updates will make the density of the MIDI data stream controllable, and offer easier ways of setting up MIDI control from the main plug‑in GUI, without the annoyance of having to open separate Settings windows. And let's not forget that even in its current form, their system exploits the possibilities of the MIDI spec far more comprehensively than any other I know of: just be aware that there is a steep learning curve associated with getting everything working, and some compromises and frustrations that arise even when you are up to speed. Given how comprehensive Blue Cat's MIDI side‑chaining features are, I was a little disappointed to see that neither of these plug‑ins supports conventional side‑chaining. This, admittedly, could never offer the same degree of flexibility, but in situations where advanced features aren't required, it would have provided a simpler, smoother and snappier alternative. Again, this is apparently on their 'to do' list for the future. 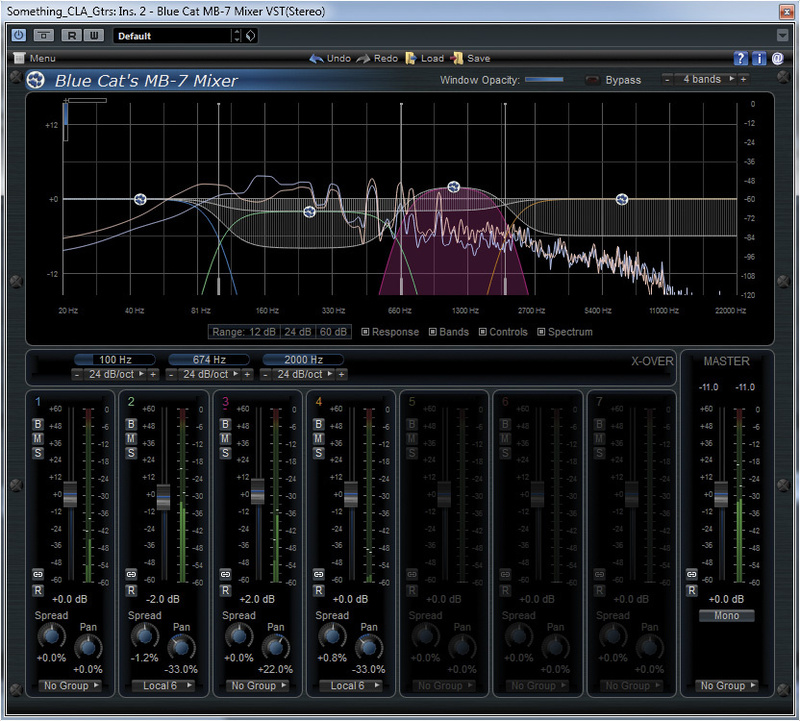 In this review I've focused on what makes Blue Cat's plug‑ins unique, but we shouldn't overlook the core features of the MB5 multi‑band dynamics processor. Although these are mostly familiar from other, similar plug‑ins, you'll have a job finding anything else quite so comprehensively specified. As the name suggests, you can have up to five bands, each with separate settings for 'upper' and 'lower' curves. The former allows you to apply conventional compression or expansion, while the latter lets you process only the low‑level rather than high‑level information. Like the signal above the high‑level threshold, this information falling below the low‑level threshold can be compressed or expanded, so you could, say, bring up low‑level ambience for a wetter mix or push it into the background for a drier result. There are independent knee settings for low and high‑level processors, plus attack, hold and release time constants. You can even determine the RMS averaging mode used by the side‑chain detector, and set it to use peak sensing, RMS sensing or any balance of the two. A highlight of Blue Cat plug‑ins in general, and MB5 and MB7 in particular, is the amount of visual feedback they give you. The large display at the top shows a real‑time FFT trace of your signal, overlaid with colour‑coded curves corresponding to the settings of the various bands. Everything you'd reasonably expect to be able to click on and move about can be clicked on and moved about, and the display is also zoomable — not that I felt I needed to use this feature much. MB5 also provides a conventional input/output graph for each compression band, and a neat global meter that simultaneously displays both level and gain reduction in each band. For mastering, MB5 is perhaps not as forgiving as some multi-band compressors I've tried; when a band needs boosting to sculpt the frequency balance of a mix, things can get harsh even though Blue Cat's band‑splitting and dynamics algorithms seem generally neutral in character. In other contexts, though, the extreme parameter ranges on offer mean you can create some pretty out‑there effects, especially when you get into abusing MB5's upwards compression. And, as I've tried to illustrate throughout this review, Blue Cat's MIDI linking system really comes into its own when mixing. The MB7 plug‑in is certainly useful on its own, but the idea of a mixer that operates on a single track makes most sense when you consider the side‑chaining possibilities. CPU load, meanwhile, is not trivial, but is lower than that of many mastering‑oriented plug‑ins. In general, I think these plug‑ins will appeal most to those who want and need very precise control, and are willing to invest some time and effort in learning how to get the best from them. If you're after creative dynamic effects that can't be achieved in any other way, or you're presented with problematic material that needs to be fixed, these plug‑ins can do things nothing else is capable of. They're not 'character' plug‑ins that will pour vintage fairy dust on your mixes, but they are uniquely flexible. MB5 has an incredibly comprehensive feature set. 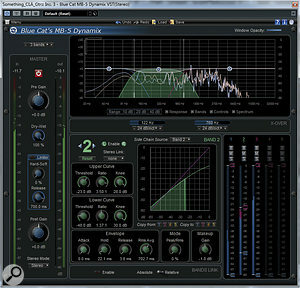 Blue Cat's clever MIDI side‑chaining system makes possible many new forms of frequency‑conscious dynamics processing. MB7 is an unusual, possibly unique plug‑in that expands the scope of Blue Cat's MIDI system. Setting up MIDI side‑chaining is time‑consuming and frustrating, and the MIDI data is too coarse to respond properly to fast dynamics. Blue Cat's latest processors won't help if you're looking for quick fixes, but offer huge flexibility and open up genuinely new possibilities to those willing to make the effort to get to grips with them! MB5 €229; MB7 €89. Prices include VAT. Dell XPS laptop with 2GHz CPU and 4GB RAM, running Windows 7 Home Premium. Tested with Steinberg Cubase 6.